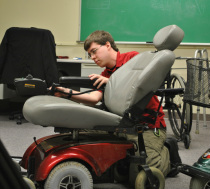 In addition to the other areas JCIL provides in service to the community, we also engage in minor repair and upkeep on select power chairs, lift chairs and other mobility equipment. We provide this service to our consumers at very low to no cost. Another part of this service is the lending of assisted technology, such as chairs, walkers and other items. Depending on a clients need or requirement, the item in question might be loaned to the consumer for a time period of several days to years, or even given permanently. Here are JCIL, your equipment donations can make the difference in someones desire to take care of themselves.